Elenita Torres went to a High School that had a specialized arts program. The High School arts program paved the way to entering an Arts College where she majored in Advertising and Design. Classes included Environmental and 3D design. While studying there she met Dean Sherriff. They started collaborating on projects which continued while working in the advertising industry. She became an Advertising Art Director on a wide variety of large and small brands to new business pitches and national campaigns. While doing so, she and Dean began collaborating on architectural model making, furniture design and poster design projects. 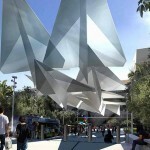 Fascination with modern architecture and modern art installation this project with the Paper Airplanes was the first opportunity they’ve had to design and build an Art Installation. Dean Sherriff’s experience began in Advertising and editorial illustration having studied illustration in art school, he produced art for print media, then expanding into animation as a conceptual designer. Dean also produces architecture and conceptual art environments for film, developing structures for the last thirty years. He is also from three generations of architects! Competitions are always subjective, and and sometimes frustrating, but knew they could submit a design to get the attention of the committee judging. That’s what got them started, it was a limited time,16 days in total from start to finish for the submission, including artist statement, project narrative, concept (which we gave four images) and a resume. 59 entries were submitted – down to 3 finalists, . The 3 finalists all consisting of teams of people were then put out to a public vote to decide which design was loved by the public. Elenita reached out to people via the local Nextdoor app. to let the neighborhood be aware of the competition. Other finalists were also on Social media and the race was tight. The support that came as a result of her Nextdoor shout out culled an amazing amount of response from locals. 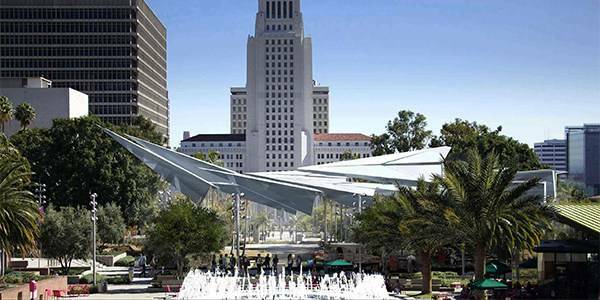 Torres wanted simply to let the community know of the competition for a Shade Structure Competition in DTLA and overwhelmingly perfect strangers were very supportive of the Paper Airplane design. 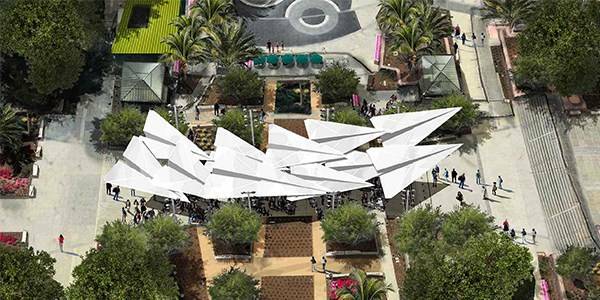 Elenita dissected the Grand Park Shade Structure program and along with Dean developed a movement in the piece that had flow – she wanted an emotional connection. She felt it was important to note that part of the research was realizing that Grand Park did events like Dance, yoga classes, New Year’s Eve Public Parties, Four of July Public Parties, but you could also go there and have a Birthday Party, play in the playground or water park. These along with seeing all the different types of people that go to Grand Park, tourist, young and old, different races and nationalities, business people, people who lived in the area, Elenita realized that what they all had in common was Play. All people have played and from the word Play, she began trying to figure out what common object have all people played with? That is how Elenita came upon the Paper Airplane. Everyone has played or created a paper airplane, there is no need to have any kind of translation, any race or culture can understand what it is. One of the program elements which is represented in the design is the 88 Incorporated Cities of Los Angeles County had to be integrated. It was solved by math: 11 planes represent 88 cities incorporated in LA, 1 plane has 8 facets, with 4 folds on the top, and four on the bottom. The bigger plane represents the eight biggest cities of LA. Pencil sketches became groupings with a bunch of planes flying in unison together. Sketchup was utilized for the scale and the dimensional rectangle in different shapes and sizes, observed from many different angles, utilizing photos from the park to establish the most dynamic angles to fit into the environment. Sketchup with Google Earth™ alignment allowed for the shade study and shadow projections. The base rises upwards of 15’ for food trucks, etc. The final determination of the gentle curve gives a nod to the garden paths, with meridians to follow the paths in the park, like a flattened map. Projections upon the surface are proposed to be done at night with a projection lens or colored light which will lend to a very wide diversity of ideas and contextual sublimations. Dean and Elenita built a practical model and presented that to the shade company to help them fully understand the complexity of the angles of each plane. The shade company will be using the lightest possible material, cleanable, shade. The actual material for the shade sail is as of yet undetermined. At first glance the rendering almost looks as if it’s a Dupont weaving sprayed with an olefin resin to make it rigid enough to be lightly supported at the ends. This type of reinforced solid could be achieved with the use of a lightweight fiber-reinforced carbon in a uv filtered acetate. This brings to mind some of the hundreds of variations for the incredible product “DirtGlue®” industrial polymer (DGip) which is a water based heavy duty formulation of acrylic polymer. White as the color for the planes, a neutral palette, was chosen as to not distract from the stunning, surrounding, garden landscape. This choice adds to the elegance that is already blossoming in the park. 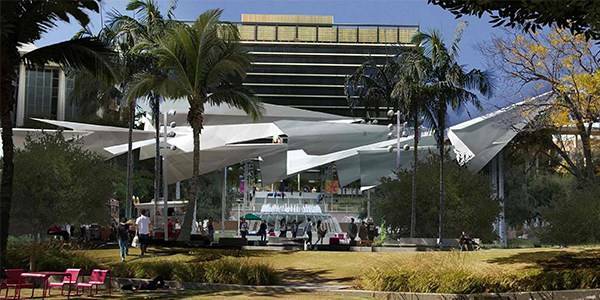 White is sincere, symbolizing peace, which is what Grand Park is all about. While the designers were incredibly inventive for the design, and presentation – the structural portion is being set up by the host facility. It is unknown how the executed design will be supported. Engineering-wise it would be very easy if the shade sails were rigidified. Such a simple idea, executed in a beautiful suggestion of form very well may put Grand Park on the map. Much like the Shiny bean in Chicago, it’s design is a scaleable cultural landmark. Internationally it’s become a draw with people all over the world writing about it on blogs, etc. It’s dynamic outside of the box, and functional. One woman wrote how her brother loved paper airplanes. After his untimely passing the piece brought out emotions that she knew he would have loved. Shortly after she and his friends got paper airplane tattoos!